Welcome to episode 6 of Mikaelinho’s Benfica save. In the previous post, Brazilian Ronaldo reviewed the youth of Benfica, including a look at the squad going into the 2019/20 season. This is a season review post. Sort of. But it’s not like most other season review posts. Of course we’ll look at how the team did in the Champions League, our ultimate goal. Did we win it? If that’s the case then the series is pretty much over and we can all get along with our lives. Spoiler alert, we didn’t win it, far from it, so the series goes on! We’ll also look – briefly – at the other results such as the league and cups. However, this is not a post of long intricate analysis of individual games or exciting narrative build-ups to a thrilling end of season. Initially I had planned to include a tactical analysis, which made the post extremely long, therefore I’ve decided to separate the two. Right now you’re reading what became a shorter (at least that’s what I thought when I started writing) season review and in the next post I’ll present my tactical analysis. The end of our road. The goal of our dreams. A Champions League title! Did we win it? No! Were we close? No! Ok, so it was a tough group. Bayern, Spurs and Inter are all teams that potentially could go pretty far in a Champions League knockout stage, so we didn’t embarrass ourselves in that sense. However, finishing dead last in our group and not even qualifying for Europa League is a disappointment. Considering that we gave ourselves a 5 percent chance of winning this wasn’t a shock, but I would have liked at least a bit of a Europa League run. Oh well, let’s start focusing on next season! Even though it looks fairly close we got a couple of points between us and FC Porto pretty early on and we kept that throughout the season. It never got exciting and we won our second title in a row. A good season. The B squad finished third in the second tier of Portuguese football on the same points as Boavista. Against newly relegated Sporting Lisbon there was absolutely nothing to do. They were way too good and the road back to the top flight was without any bumps whatsoever. The U19s did well, pretty much as expected. I would much rather have had a 1st than a 2nd place finish in the U19 Premier League, but the U19s managed to win some silverware by topping the U23 Premier League instead. As you all know, the match results for these players are secondary, but it’s still nice to win! On intake day last season we invited a young boy on trial from Varzim. His name was Mateus Imbamba and he looked amazing. He left all the scouts and coaches at the trials with a feeling that this player could be Portugal’s “Next Great Thing”. In ten years from now, kids on the streets of Lisbon could very well be playing pretending to be “MI7” instead of “CR7”. Luckily we managed to sign him and he has already been given several opportunities, despite his young age. Pretty much immediately he also started paying back! For a total sum of just above €120M up front three of our best players left the club. I wasn’t particularly interested in selling any of them, but a combination of getting unsettled by the big club interest and release fee clauses forced me into it. João Félix is the player I’m most sad to lose since he had already become a key player for us and could have played an integral part in our hunt for a European title next season. On the upside manager Ronaldo now has an amount of money at his disposal that makes him able to sign any U18 player he points at. The harsh reality is that we are not top of the food chain at the moment, but when our best young players leave for sums like the ones above it certainly softens the blow of them leaving. It’s another setback for our short-term plans but a leap forward when looking at possibility to invest into the future! Besides the big money signings above, we had to say goodbye to a few other players for a different reason. The end of the line – Say goodbye to the 98s! The players born in 1998 were few and in all honesty didn’t make that much of an impact. Only three players remained with the club long enough to become victims of the U21 age rule and were subsequently sold as they turned 22. The only true A squad player, centre back Branimir Kalaica brought in some decent money when he left for West Ham and we wish him all the best. I was quite surprised though that we managed to receive just above €5M in total for Willock and Pinto as I was ready to release them for free! With around €250M in the bank the finances are stable to say the least. If we can keep our best players until they turn 22 I think we will be looking at even bigger sums over the next couple of years. 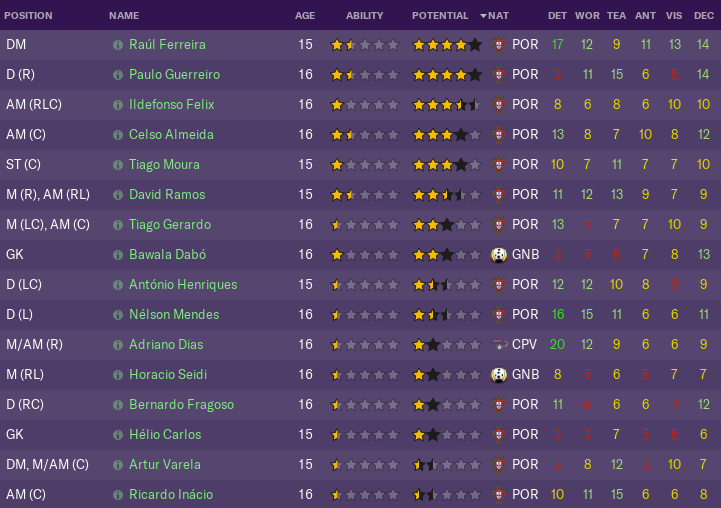 There’s been a lot of talk about the future and I know that you are longing for it, especially with my next tactic post in mind, but before we end this episode let’s look at the youth intake! So, the news everyone dreams of on intake day. A golden generation!!! Hush though, whisper it quietly, because things aren’t always what they seem to be. Let’s take an actual look at the players before we start celebrating! Well, it’s not bad. But on the other hand it doesn’t make you fall off your chair either. Without straying too far from reality one could argue that a player needs at least a 4 star potential to become a really good football player. By “really good” I mean “play in a Champions League final good”. On paper that leaves us with five players. When looking through the individual players only one of them really stands out though, but he looks marvellous! This is basically the dream player to come through an intake! Firstly, a five-star potential. Check! Perfectionist personality. Check! A great Eagle Rating. Check! This guy looks perfectly suited to provide Mateus Imbamba with killer passes! Now, it’s time to end. The post didn’t become quite as short as I thought when I started writing, but I hope you enjoyed it! As I wrote in the beginning, the next episode will be a massive one analyzing both my current tactic and player performances this season. Stay tuned! 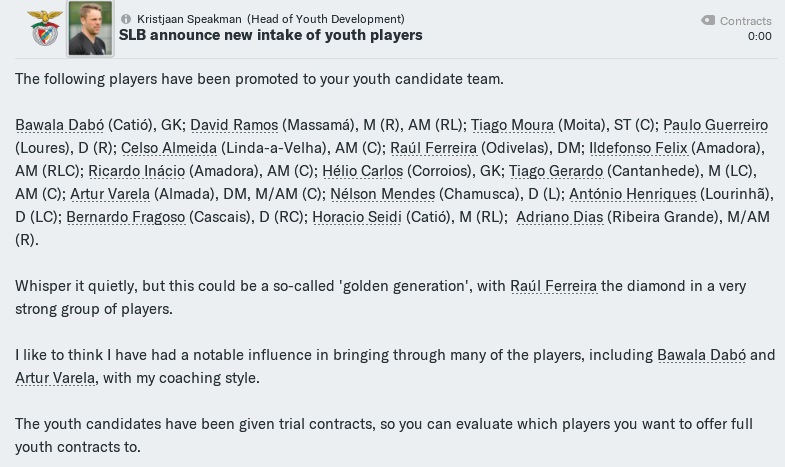 This entry was posted in FM19 Stories, Football Manager 2019 and tagged benfica, fm stories, fm19, football manager, portugal, primeira liga. Bookmark the permalink.